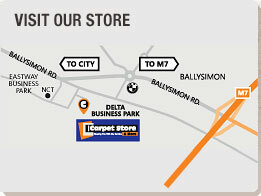 At The Carpet Store and More we stock a wide range of Laminate Floors. Laminate floors have become very popular over the past number of years and if you love the look of real hardwood but are concerned with the upkeep than laminate floors could be your answer. Laminate floors are so easy to maintain but you can still have the look and feel of a Hardwood floor. Laminate flooring works well in high-traffic areas and homes with pets. It is scratch-resistant, durable and easy to clean. It also is environmentally friendly because it uses less wood in its construction. If you are looking for the perfect laminate flooring for your home call in to the Carpet Store and More to view our full range of laminate floors.